Opera is one cool and best looking web browser. 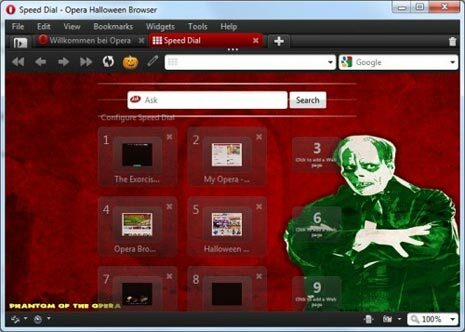 Now you can get into Halloween spirit (celebrated on October 31) using Halloween special Edition Opera browser. Basic Halloween elements like: Scary, bloody, bats, pumpkins form the look of this special edition browser. New Opera users can simple download this Halloween special Edition browser (for Mac & Windows) and start using it. 1. Open menu “Help” » “About Opera”. 6. Install the customized version (without removing the previous one). Also See – Halloween audibles on Yahoo Messenger, Spook out!